Cesena have been promoted to Serie A four times, so they know what it means to suffer, unlike some other Milan team. They are known as the “Cavallucci Marini,” or Seahorses, but do not let that nickname fool you, they are not as docile at home as their name seems to be. They scored quick and got a two goal advantage against Empoli but then got hit with two goals to tie up the match, I guess we can say it’s inversely related to Milan, which could be good news or bad depending on how we face the opposition. Despite their heavy away loss against Juventus 3-0 they will be looking for blood so their home crowd can be pleased and wash away the bitter taste of losing a lead. Bisoli has definitely watched Milan’s match against Empoli and will be instructing accordingly on how to face the match. Their forwards will be a problem but if we cut their midfield we will be able to slice their supply. Although Milan comes from a tie they will be looking for a win and it will certainly not be easy on away grounds. If Inzaghi decides on a similar formation, as we saw against Empoli, we can expect a similar game to what we witnessed against Empoli, at least in the second half of the first 45 minutes depending on how the match goes. Why? Because I believe Bisoli will be a tad cautious in the beginning to allow his players to settle in then he’ll instruct on how to proceed. That being said, I believe the coach will instruct his players to do what Empoli did, which was pass the ball through the middle to mimic what worked for them and in that way get to the danger zone for Milan. 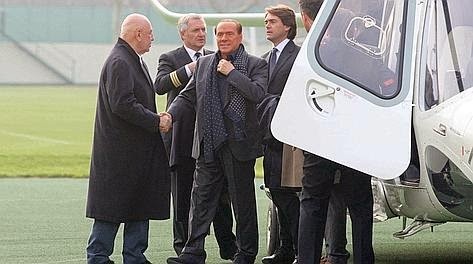 Inzaghi will need an energized De Jong and a faithful second midfielder if he is to follow what the Lord and Savior Berlusconi has told him…which could be either to play attacking football or to call up more fans so he can get his Bunga Bunga Parties revenue in check. "Do as I say, not as I spend"
Personnel doesn’t really help him as many are injured but with the displays of characters such as Bonera and Muntari will Inzaghi dare to field them again? He says Bonera distributes the ball better, however Mexes has a greater long-ball skill than Bonera and is better equipped to deal with dead ball instances. Or Rami who is better than Bonera at almost everything except…well…taking care of Messi… What about Muntari, who has been a ghost or a nuisance when it comes to cover the defense? One time tackles don’t really count for much and I’d rather see some who runs and attacks the opposing player. The Seahorses should be an easier opponent to face but the shakiness of our defense is something to worry about. It’s great to outscore an opponent but if we are to play our best we need to keep the seal tight and since that’s really not an option with this Milan team, we will need to hope that our midfielders are more alert than our defense…after all, ham is not traditional Milanese cuisine, and if we’re to visit… well, let’s change tradition, let us introduce veal cutlets to their menu, enough of the ham.